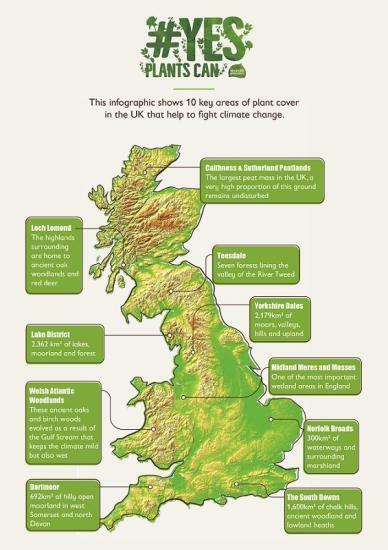 New report by leading scientist warns the UK not to ignore the power of plants to fight climate change. Scotland's Caithness and Sutherland Peatlands are home to the largest peat mass in the UK, with a very high proportions undisturbed ground, making it a key area for fighting climate change. Plants have the power to account for 37%1 of the required cuts by 2050, but take up just 7% of public discussion - reflecting a major imbalance at Government level . New poll shows public want greater funding for natural climate solutions (70%)3 with majority voting in favour of paying more tax to fund this (52%). Within three generations, the UK climate could resemble that of Southern Italy, with fires and flash floods, but combined with harsh ‘Beast from the East' cold spell. Restoring biodiverse landscapes in the UK is an essential part of the climate change solution, according to a new report from climate change scientist, Mark Maslin - which found that planting on just 2% of the UK’s land would absorb the emissions of every vehicle in the UK and would have the same impact as 75% of the country switching to a vegan diet for a year. The report was commissioned by Seventh Generation, an eco-friendly household cleaning company, alongside plant conservation experts Plantlife, as part of a new campaign to get plants higher up the climate change agenda. The report highlights that, although plants could account for over a third (37%) of the required cuts by 2050 under the UK Climate Change Act, they currently take up just 7%2 of public discussion around climate change – reflecting a major imbalance at Government level. A new poll, commissioned alongside the report, also reveals powerful public support for plant-based solutions, with a majority (52%)3 of the 2,000 adults polled voting in favour of paying more tax to restore biodiverse landscapes, and 70%3 expressing a desire to see greater government funding. The report also reveals that the full potential of plants to help fight climate change is even greater than the Government’s current ambitions and could account for a third (37%)1 of the required cuts by 2050 under the UK Climate Change Act. This would be achieved through optimum management of bogs, grasslands, arable and horticultural lands, and by increasing forest cover to 18%1 of the UK. Mark Maslin, professor of earth system science at University College London, and the author of the report, said: "Not only are we not currently using plants to their full potential, but we also have among the lowest rates of forest cover in Europe at 13%, compared with France (37%), Germany (32%), Belgium (32%), Italy (35%), Spain (37%), Norway (37%), Austria (47%), Greece (28%), Sweden (69%) and Finland (72%). Outside of Europe, Japan has the same number of people per square mile and has 67% forest cover. There’s no reason why we can’t do better." Seventh Generation is a plant-based household cleaning product company with strong beliefs about the rights of people and planet. New to the UK, the brand has a long history of activism in the US; their #ComeClean campaign, which calls for manufacturers of both consumer household and industrial cleaning products to disclose all intentionally-added ingredients on their product labels and websites, has resulted in a review of legislation at both a state and federal level.